urrently, the Environmental Services Department consists of two divisions: the Storm Water Division, and the Hazardous Materials Division. The Storm Water Division deals with issues involving water quality, watershed management, household hazardous waste issues, illegal dumping, and construction and industrial storm water permits. Furthermore, the Hazardous Materials Division deals with storage, handling, and transportation issues involving hazardous materials. 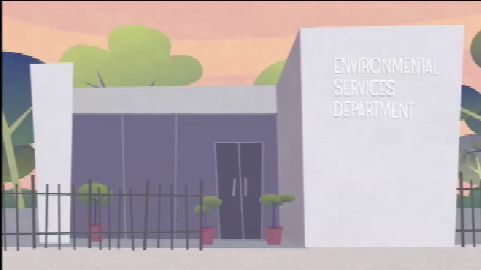 In order to preserve and protect Laredo's environment, the ESD has developed various programs to deal with multiple environmental issues that face the City of Laredo. Through these programs and through excellent customer service with the citizens' of Laredo, the ESD strives to ensure a healthy environment for Laredo's future. The ESD also strives hard to bring the citizen's of Laredo new programs and projects though joint projects with other agencies as well as through aggressively applying for grants. In fact, the ESD has received$15,038,368.00 in grant funding since 1995. For more details Click Here. Tire Collection RoundUp Event - March 1, 2014 View the Flyer HERE. Town Center Presentation View the overview HERE. Chacon Creek Master plan Overview View the overview HERE. Chacon Creek Master plan Phases View the phases HERE. Chacon Creek Existing Conditions View the existing conditions HERE. Chacon Creek Master plan Download the plan HERE. Chacon Creek Lake QA/QC Plan View the plan HERE. Chacon Creek Lake Cleanup Plan View the plan HERE. Chacon Creek Feasibility Study View the presentation for this exciting joint project with the US Army Corps of Engineers on Chacon Creek., Click Here! for the presentation in Flash. Chacon Creek Restoration View the restoration project for Chacon Creek as well as the Chacon Creek Master plan. Click Here! ESD Earns Highest Environmental Excellence Award in the State The ESD has been awarded the 2005 Texas Environmental Excellence Award, competing against over 140 total applicants and 24 category (education) applicants to be awarded this prestigious award, Click Here! for the full story. Checkout Bag Ord. (Passed Ord.) Click Here.